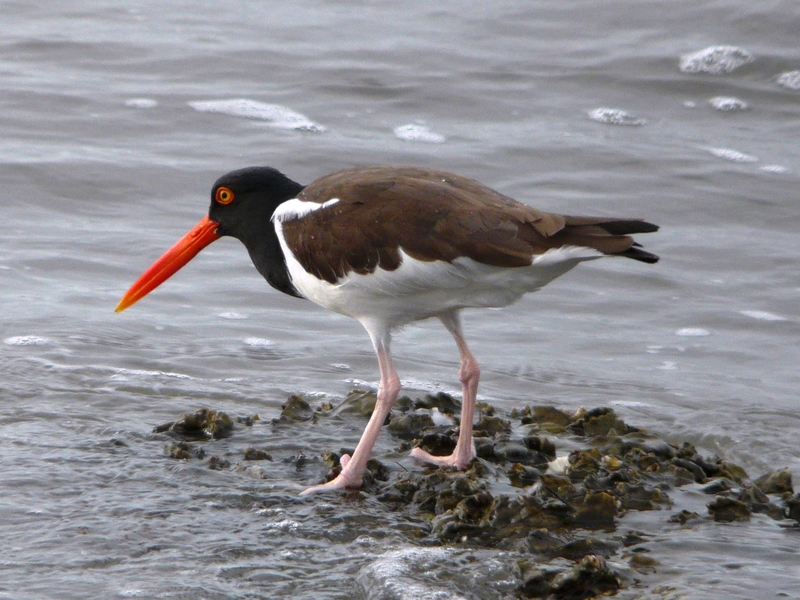 “Shelley, look, there’s your Oystershucker!” I fondly remembered finding my life American Oystercatcher with my friend, David, in St. Pete as I flew there on March 2. David and I had a day and a half to bird together before he would drive me to meet my son-in-law, Jeff. David is not a real birder and that’s why I love birding with him. We once watched a Great Blue Heron try to eat a fish for half an hour. If I had been with a “real birder”, I’d have been embarrassed to pay so much attention to a common bird. This time we watched three Mourning Doves for 15 minutes. While field guides don’t show differences between males and females, we were sure that the grayer bird was a male and the browner ones were females. The male showed a patch of glowing iridescence on the side of his neck as he puffed himself up and strutted towards the females. We thought that they would mate right in front of us and prove who was who, but picking for food in the grass won their interest. A little research after the trip revealed that there IS a difference between male and female Mourning Doves which Bill Hilton describes and illustrates with gorgeous photos MOURNING DOVE: EXTERNAL ATTRIBUTES OF A FAVORITE GAME BIRD. 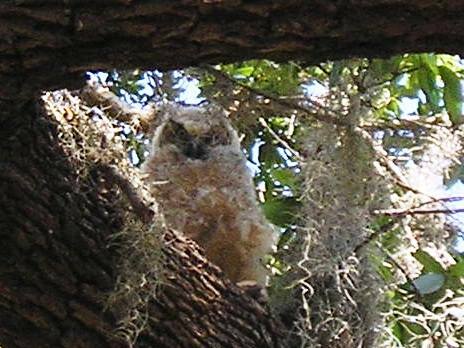 Saturday we visited Kapok Park, where we saw both Great Horned owlets and mom. The owlets were big “branchers” now and out of the nest, fuzzy and adorable. Great Horned Owls have nested at Kapok for several years. The photo at left was taken by David in 2009. Sunday dawned so windy that we had to change our plans for morning birding. Instead of looking for Marsh and Sedge Wrens, we decided to drive the Dunedin causeway to look at shorebirds (much to David’s relief, I suspect). We enjoyed quite a few birds including our favorite Oystercatcher, but I was most excited to realize that I could confidently identify winter-plumaged Red Knots. All the shorebird study was paying off! On Monday, Jeff and I drove to Miami to look for White-crowned Pigeons and countable exotics. We headed to a location in the middle of Miami where two pigeons had been reported on utility wires. Sure enough, we surveyed the area for 15 minutes and a White-crowned Pigeon appeared right in front of us just as we here about to leave. Life bird #1 for the trip! Jeff’s friend, Tom Trotta, joined us for a day in the Everglades on Tuesday. Tom is President of Friends of the Florida Panther Refuge and Jeff is a volunteer with this wonderful organization. Our target bird was Short-tailed Hawk, which we failed to find, but it was a pleasant day that started with a Scissor-tailed Flycatcher and produced another White-crowned Pigeon. It was much more satisfying to find a pigeon hidden in a clump of trees eating pigeon berries than to see one on a utility wire. The shy bird was well hidden, but we clearly saw was its face, white iris, and white crown. This was how birding should be.